I am rising senior at the Alabama School of Mathematics and Science in Mobile. My interests are anime, piano, and learning about mathematics and logic (of course). I hope to major in either computer programming or engineering. 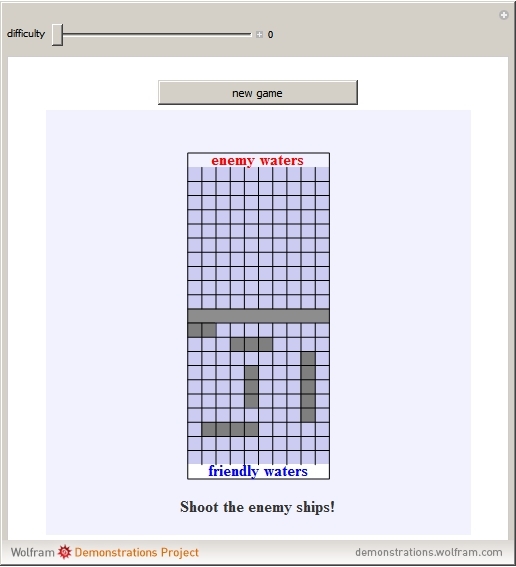 Torpedoes is a Mathematica creation of the popular board game Battleship. Both the player and the NPC first place five ships of lengths 2, 3, 3, 4, and 5 on their side of the board, however, either player cannot see the other player's ships. Players place each ship by clicking the first square of the ship on their side of the board, then clicking the adjacent square in the direction of the ship. Players then click the opposing board in an attempt to hit and destroy each of the enemy's ships. The goal of the game is to destroy all of the enemy's ships before it destroys your ships.